As your Herndon, VA movers we want to do everything we can do to make your move as smooth as possible. Whether you’re relocating to Herndon, moving within Herndon or relocating to another part of the Washington, DC metro area, we’re here to help! We can even move you cross country with our national vanline. We’ve taken the time to compile some resources that might help you as you settle into your new home in Herndon, Virginia. Before we get to the local resources, here's a list of some of the local and long distance moving services for home & business that My Guys Moving & Storage provides. Since you’ll have to set up utilities right away, we wanted to make this as easy as possible for you by listing them as a quick reference guide for your move into the neighborhood. Is FiOS Available in Herndon? Herndon is a bit more expensive to live in than the rest of Virginia. According to AreaVibes.com, the cost-of-living index is at 125 (the national average is 100). The average apartment monthly rents will typically be between $1200 and $2200. On average, you can expect to pay $400,000 to $500,000 to buy a home in Herndon. However, there’s good news too... it’s 9% cheaper to live in Herndon than it would be to live in Washington DC, making it a popular suburb for government employees and others who make their living in our nation’s capital. Students in Herndon are part of the Fairfax County Public Schools district. There are 13 public schools and 14 private schools in the area. Below you’ll find the public schools with the highest test score rating as reported by Education.com. You can use the Fairfax County Public Schools Boundary Locator to determine which school your children will attend when you move into your new home. If you haven’t chosen a new home and you have a preference, be sure to check this site before closing on your house or signing your new lease! If you’re driving to Washington, DC then you’ll have a very reasonable commute at just 41 minutes (though given local traffic patterns it’s wise to leave yourself an hour and a half to get there, just in case). You’ll take VA-267 and I-66 E to get there. The Silver Line will connect Herndon directly to DC. For now, you can take Bus 950 to hop on the Silver Line at Wiehle-Reston East. Frying Pan Farm Park – A working farm using technology from the 1920s to the 1950s. Visiting the farm is both educational and a lot of fun. The farm staff runs a slew of fun events throughout the year. Next Stop Theatre Company – Take in a live performance at this highly-regarded professional black box theatre. There are six performances every year. This isn’t just some community theatre. Shows bring guests from all over Fairfax County and beyond. The Herndon Community Center – A 56,000 square foot fitness facility with a pool, racquetball courts, an indoor spa, drop-in child-care classes and fitness classes. It’s a great place to meet new people in addition to being a great place to work out! One thing you should know about Herndon is that your car has to have a special Herndon resident sticker if you’re going to be parked there for more than 30 days. You can get your sticker by visiting this link. At My Guys Moving, we have the expertise to handle every aspect of your Herndon move. We handle large, complex moves all the time, and we know how to make it easy for you. We even handle complex situations like moves involving fine art and antiques or pianos. We’re licensed, bonded, and insured, and we do provide packing services. Call 703-406-9605 or simply fill out the Free Moving Quote form on this page and One of the Guys will be right with you! Thanks for contacting MY GUYS! 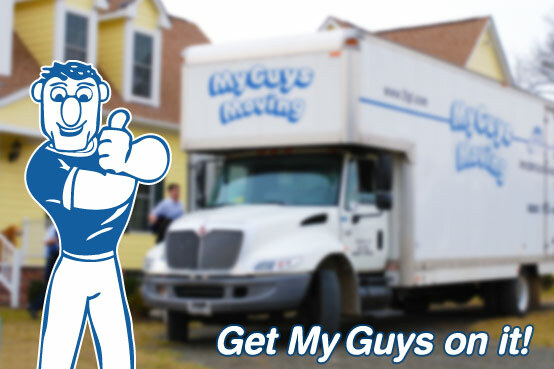 My Guys Moving & Storage, Inc.
Movers in Northern VA, Movers Reston VA.